If you’re looking for acountry that has anyhting to do, or many other atractions that await you, Indonesia might be the right answer. In here, there are some places that have some of the best choices for your holiday. To spend a holiday here, the charges are also considered cheap, compared to the other neighbor country, like Thailand. Also, in here, there are natural attractions that still look good until now. 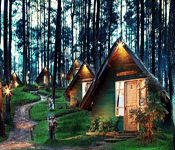 But for now, we want to tell you about all the things to do, all the attractions that can be found in the area of Bandung, West Java, Indonesia. All the informations you need are in the paragraphs below, so be sure to take a look at them closely. The first place is this little spot in Bandung called Padalarang Stone Garde. For your information, this is the spot if you’re looking for the best natural attraction in Bandung. The place is basially a hill that filled with some little rocks everywhere. Not only the hill, there’s also a small savana in here which is looks spectaculr, especially during the morning. 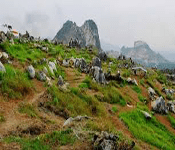 It’sa great place for hiking and trekking too. Enjoying the view with your friends and family here would be a great journey. Next one is the crater with the white colour. Because of that, this place was named as Kawah Putih or White Crater in English. The crater itself is located in the mountain of Patuha, around the Ciwidey area of South Bandung. It can be so cold in here . The clodest weather in here even reaches the 8 to 22 celcius. Before actually arriving to the place, you must take a walk a bit first, walking through the tea gardens that present around the area. In the third place, there’s this Farm House, which is also a good choice if you’re vacationing in Bandung with your family. In the entrance, you’ll have to pay the entrance ticket, which later can be changed with either milk or sausage. In the place, you can see many beautiful things. First, they do some beautiful flower plantations to make the place more lively. Also, there’s unique house of Hobbit in here that can be your unique background photo. 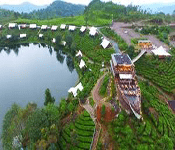 Going along with the same them as the attraction above, the De Ranch Bandung is place that resembles very well the condition in the era of cowboy. Of course, in here youc an start being a real cowboy with a real horse. They have this kind of clothes rent in here. After doing the administration, you can your horse can take a long walk going around the area of De Ranch. After done with it, you can relax a bit by enjoying the fresh milk produced. Of course, we also want to included this one as a great public holiday in Bandung. Who doesn’t know this place? 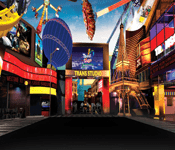 Serving as an entertainment and also educationg center, Trans Studio always reaches the popularity so easily by providing so many interesting rides and services. In here, there are so many choice of family friendly rides, and spme of them are really good for the kids. Inside, there are also some clothing stores and souvenir stores that sell exclusive goods to the customers or the tourists. But, beside having the relaxing rides, Trans Studio Bandung also has rides that can pump your adrenaline level to the roof. Next one is the World of Upside Down. If youw ant to try to create a good looking pictures which can tell you that you’re up on roof when everything is normal, then visiting this place would be a great opportunity for you. It’s a place for being much creative as possible, by combingin unique movement to the environment. If you’re confuse of what is actually going on or what you can actually do in there, don’t worry beacuse there’s a guide in the spot who can tell you what to do. Also, the guide can be a camera man for you, for taking good pictures. Of you don’t actually know about the place called Grafika Cikole, it’s basically an attraction that combined with lot of stuff like camping area, and also restaurant. Well, because of the nice view in here, especially becasue being surrounded by the tall pine forest, the place is really good for doing outdoor activities like camping or trekking. Beside that, there’s also a restaurant here, which is looks very unique beacuse all the architecture made from the woods, which fit perfectly with environment around. The view there is also can be a thing to increases the taste of food dramatically. Another unique restaurant that available in Bandung, which is combining the aspects of anture is this Pinisi Resto. 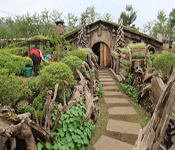 It’s located just few meters from the lake called Situ Patenggang. Built with such an unique strucure of a ship, Pinisi Resto started gaining popularities within short time. Eating in here will be much and much unique experiences, because the place itself looks cool, plus the additional environment condition which also looks very great can make every one in here feel comfortable and want to spend some more time in here. If you looking for another great choice of camp site, maybe Rana Upas Ciwidey can give you more satisfaction. In Ciwidey area, there are some animals that can be interact with if you’re careful enough. 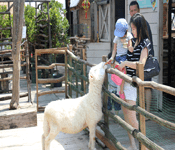 You can also feeding some of the animals there, like deers, etc. But, the weather in here is quite extreme. It’s pretty normal during the day, but in the night, things can go badly. So, be prepare to feel the minus7 celcius degree in here. Wear some warm jacket or maybe the thing clothes. On the rooftop of a mall called Paris Van Java, which is also one of teh famous malls in Bandung, there’s a mini zoo that well prepared by the mall’s management to provide the educational yet fun activities to the family. In there, you can find some herbivore animals, completed with their habitat’s replica. You can also visit the bird park there if you want. Beside looking at animals in the zoo, you can do other things like doing ice skating, and feeding the animals in there. So, that’s our complete list of the public holiday spots in Bandung. As you can see, there are actually fifteen of them on the list. But on the reailty, the number is keep increasing, especially because of the crativity of the Bandung people that always can find some places new for the tourists. The list ain’t your limit. So be sure to visit them all during your stay!